Comprehensive urban projects centering on central train stations transformations can be a boon to a city and its urban environment. They can also be the center of a slow struggle between the public and the authorities. Such is the case of the rather well known Stuttgart 21 project which is focused on Stuttgart central train station. 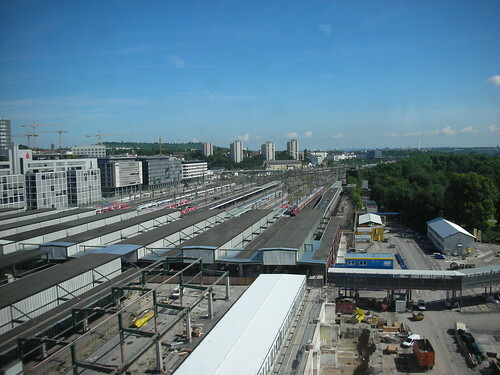 The station is to be upgraded to improve the high speed rail connections in Germany and Europe and allow for new urban developments in the city of Stuttgart itself. Stuttgart is an industrial city with plenty of traffic jams made of Mercedes cars, which also provide the city best known tourist attraction. 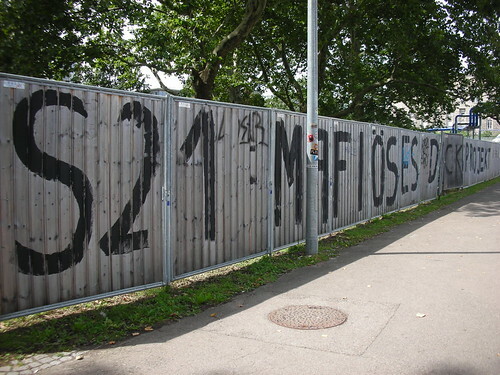 The Stuttgart 21 project itself has been in the air since the mid-1990s but ran into major opposition and demonstrations throughout the years, much of it the result of ignoring public discussion. The jist of the project is transforming the Stuttgart central train station from an end station to a through station improving the time of the ICE express trains in Germany and the intrenational trains crossing Europe (from Paris to Budapest and everywhere in between). This change calls for a 90 degree rotation of the train station alignment and also involves moving large chunks of the train tracks underground. Furthermore, like other projects of this magnitude, this project involves extensive changes to its surroundings. Moving the tracks underground frees up inner-city land for new urban construction resulting in plans for two new quarters inside the city (the Europa District and the Rosenstein Quarter). These projects promise to offer top notch contemporary urban qualities based on mixed-use and high density and also return some of the project costs. The project itself is currently estimated at 7-9 billion Euros, much of it covered by the federal German government and portions of it also covered by the state of Baden-Wurrtemberg (similar to the USA, Germany is also divided to states) and by the European Union itself. While visiting the project grounds last summer and the extensive visitor center at the station it seemed like the project people are very proud of the engineering feats that are needed for the realisation of this project. While engineering capacity is extermely important, the main cause for the project two decades delay was the missing public dialogue. The Stuttgart 21 project is also the main reason that the Green Party is now in control in Baden-Wurrtemberg, a traditionally conservative area with a strong industrial inclination. The Greens, after initiating the public consultation have managed to somewhat improve the project and actually get it finally going. In conclusion, the Germans could learn a lot from the Dutch way of engaging with the public and I certainly hope other public entities in Germany (and elsewhere) can learn from the lessons offered by this extensive and slow project.